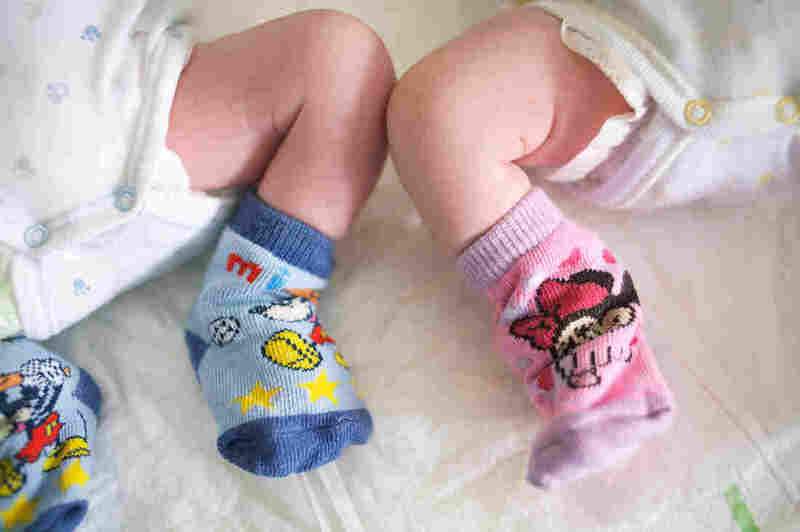 The Genes Behind Why Fraternal Twins Run In Families : Shots - Health News Scientists identified two genetic variants that make it more likely that a woman will give birth to fraternal twins. Knowing this might help develop safer fertility treatments. Fraternal twins come from two separate eggs, unlike identical twins. Fraternal twins tend to run in families, and scientists think they've identified genetic variations at play. Understanding that might someday help predict who is more likely to have a risky pregnancy, and might also help treat fertility problems. A team led by Dorret Boomsma at Vrije University in Amsterdam studied the DNA of 1,980 mothers who had given birth to fraternal twins, as well as 12,953 people who had no history of twins in their families. They found that the mothers who had variations in two genes, FSHB and SMAD3, were 29 percent more likely to give birth to twins than mothers without those changes. This study, which was published Thursday in American Journal of Human Genetics, is the first twin study to rapidly scan the DNA of people looking for key markers, using a technique called genome-wide association study. The researchers were looking for common genetic variations that are associated with giving birth to twins. One prime target was FSHB. It's a gene that prompts production of follicle-stimulating hormone, which helps ovaries produce eggs and is tested to evaluate fertility. The researchers found that women who had altered regulation of the FSHB gene had higher levels of follicle-stimulating hormone in their blood. Those women would be more likely to produce two separate eggs at once, resulting in fraternal twins. The other gene, SMAD3, plays a smaller role in twinning, but does help the body respond to follicle-stimulating hormone. The scientists think knowing about the genetic influences could have applications in reproductive health. Multiple births are riskier for both the mother and children. Developing genetic tests based on these variations could give a better idea of which women may be more likely to have multiple births. And it also might someday help improve fertility treatment. Women who undergo fertility treatment often use hormones to stimulate the ovaries and produce more eggs at once. As it stands now, there is no good way to gauge how much medication a particular woman may need. This can occasionally lead to ovarian hyperstimulation syndrome. The authors hope that they can someday use their findings to design a genetic test that could identify women who are at risk for severe responses to hormone therapy. This tool might be used to help doctors determine appropriate dosage of hormone treatment. The initial version of this post said incorrectly that the twin study was published in Journal of Human Genetics, when it was, in fact, published in American Journal of Human Genetics.